InPlais Non-Slip Area Rug Backing 16-oz. Keep rugs and carpeted areas from sliding with a non-slip rug backing that protects surfaces and makes it safer to walk around. Keep Rugs & Carpets Down – This innovative non-slip rug adhesive can be brushed onto the bottom of your rugs and carpets to give them a latex backing that keeps them from sliding or bunching up on tile, laminate, or hardwood flooring. Complete Home or Office Use – Apply our area rug grip on area rugs in your living room, runners in the hallway, punch rugs, wall hangings, or even slippers that need a bit of extra grip while you’re walking around. Easy Application Process – Adding our area rug backing to your fabrics is simple. Just flip them over and paint on the liquid coating. Once dry, the latex finish will provide a soft, flexible, non-slip barrier to reduce falls and spills. Fabric and Floor Safe – This rug bottom coating not only offers better high-traffic support for kids and families, it won’t stain fabrics or scratch wood floors to ensure your flooring and your personal effects stay pristine. Satisfaction Guaranteed – Every order of InPlais non-slip area rug backing is formulated for safety and long-term durability you can rely on. What’s more, our products are backed by unbeatable customer service for a risk-free purchase. Avoid falls or slipping due to sliding rugs or carpet by applying InPlais, a bottom rugged adhesive that adds a slip-resistant barrier you can trust. It’s estimated that the leading cause of injury-related death for adults age 65 and older is a simple fall; the majority of which are caused by household accidents due to slipping on lose rugs. InPlais is designed to help add a non-slip barrier to your floor rugs, preventing them from sliding, bunching, or causing accidents, even if they’re on tile, laminate, or wood flooring. 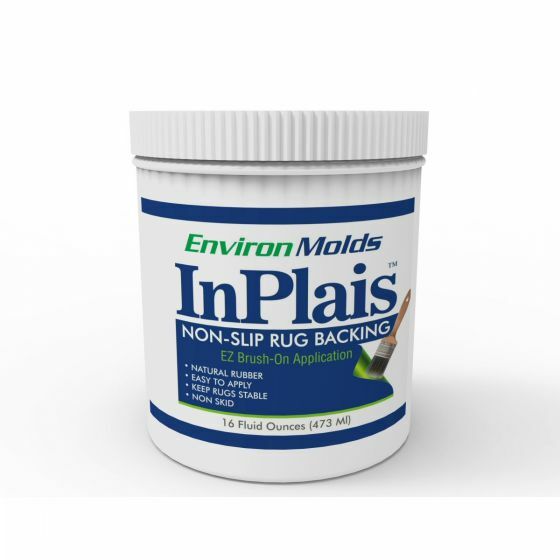 A smart choice to secure area or household rugs, runners, or even slippers, InPlais rug backing formula is crafted with pure organic natural latex rubber that’s safe and effective. By brushing it onto the fabric of your fabrics’ surface, you can keep it secured firmly and discretely. Once your rug is upside down, vacuum the surface to remove debris. The brush the back of the run with a thin, even coat of InPlais. Two thin coats provide a firmer non-slip surface. InPlais dries virtually invisible. Keep rugs and carpeted areas from sliding with a non-slip rug backing that protects surfaces and makes it safer to walk around; click ‘Add to Cart’ above to get InPlais today! You're reviewing:InPlais Non-Slip Area Rug Backing 16-oz.